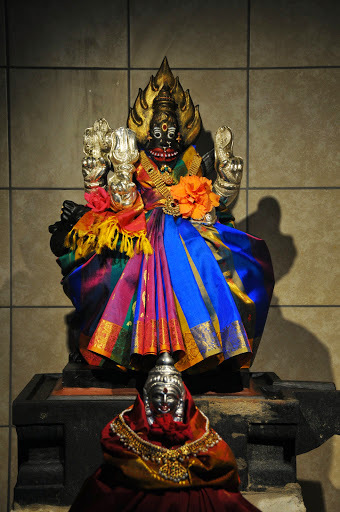 Pratyangira Devi is all powerful goddess and believed to have given the necessary energy and power to Vishnu when he takes up Nrisimha avatar to kill Hiranya Kashipu. Ours is again the only temple in the western world that has Goddess Pratyangira Deva. In the same sannidhi, at her feet is Maha Meru resting on kurma. Maha Meru is also considered as representation of Lakshmi Devi, and the engineering plan view of Maha Meru will give you the design of Sri Chakra yantram, which normally devotees keep in their homes for prosperity. Homam on every Amavasya in the evening during (from spring to winter time)…. Pratyangira Devi is prayed to avoid dhrishti dosham, and Maha Meru is prayed for money and prosperity.